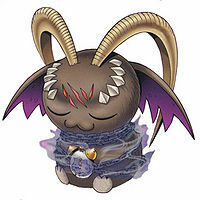 A Demon Lord Digimon that is said to be sealed in the deepest parts of the Dark Area. As the strength it possesses is too immense, its data is said to have been put in a sleep state by the Digital World's system, although the truth of the matter is uncertain. Because it has fallen into a deep sleep, it cannot unleash its own attacks, but it is able to inflict damage to Digimon just with its snores, and for that reason it won't be easy to attack Belphemon: Sleep Mode in its sleep. 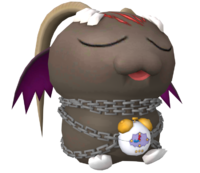 Its Special Moves are the "Eternal Nightmare" it invokes with its peaceful snoring, and black flames cast from the chains coiled around its body (Lampranthus). "Eternal Nightmare" is encouraged if you are suffering from a lack of sleep. It will promise an eternal slumber. 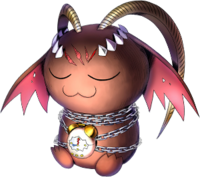 An Ultimate Digimon who counts as one of the Seven Great Demon Lords. It hides an enormous amount of unimaginable power from its cute sleeping face. 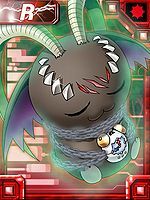 — Digimon Savers: "Destructive Power, Shine Greymon Runs Wild"
A Demon Lord Digimon that is said to be sealed in the deepest parts of the Dark Area. As the strength it possesses is too immense, its data is said to have been put in a sleep state by the Digital World's system, although the truth of the matter is uncertain. n., From Belphegor (「ベルフェゴア」 Berufegoa), a demon in Assyian mythology that tempts lazy people with inventions but these usually cause misfortune. n., Sleep (「スリープ」 Surīpu) is a state of inactivity; Belphegor is said to sleep for a thousand years. Also a reference to sleep mode. 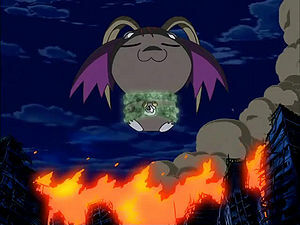 Anime/Manga Digimon Savers: "Smash Kurata's Ambition, Yatagaramon takes Flight"
Lampranthus  ランプランツス Ranpurantsusu Unleashes bolts of energy from its chains. Eternal Nightmare  エターナルナイトメア Etānaru Naitomea Yawns, unleashing powerful shockwaves. 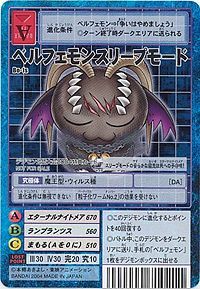 Belphemon Sleep Mode's Digitama was found sealed away in some ruins discovered by Kurata Akihiro. 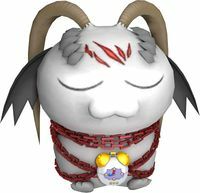 On a whim, he decided to nurture the DigiTama, it eventually resulting in Belphemon. 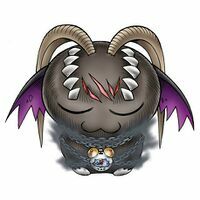 Kurata proceeded to collect Digimon life energy to strengthen and awaken Belphemon to use as a weapon. 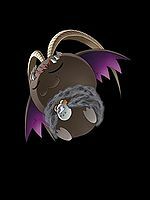 Using a command device created by Thoma, he awakened Belphemon Sleep Mode. Belphemon seems to be completely invincible while asleep, being completely unscathed by any attacks by the DATS team and even several missiles. 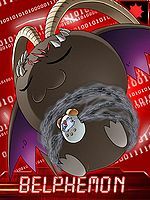 After the bomb in the command device breaks and Belphemon Sleep Mode becomes stationary, Kurata fuses himself with Belphemon, causing him to wake up and evolve into Belphemon: Rage Mode. 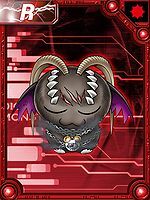 Belphemon (Sleep Mode) is a Mercenary Digimon which can evolve from Astamon at level 41 and can further evolve to Belphemon (Rage Mode) at level 70 with the item Alarm Clock, referring to the awakening of its true form. 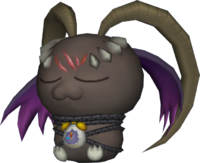 Belphemon: Sleep Mode appears on screen whenever Rage Mode goes to sleep. Sleep Mode's peaceful snoring is an Eternal Nightmare! 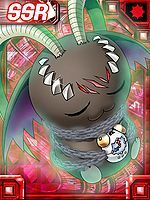 ↑ 5.0 5.1 Digimon Savers: "Destructive Power, Shine Greymon Runs Wild"
↑ Digimon Savers: "Demon Lord Belphemon is Revived"
This page was last modified on 13 April 2019, at 08:33.